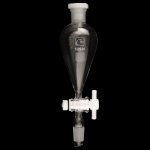 Squibb style separatory funnels with a PTFE stopcock, a top outer standard taper joint and an inner standard ground joint at the stem. Supplied with plastic stopper. 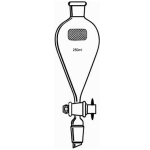 Capacity 60mL. Joints size 14/20. Bore size 2mm. Capacity 125mL. Joints size 19/22. Bore size 2mm. Capacity 500mL. Joints size 24/40. Bore size 4mm. Capacity 1000mL. Joints size 24/40. Bore size 4mm.